We have negotiated a special room rate with the hotel - $105 + tax. After December 15th, the rate jumps to $230 + tax per night. You must tell them that you are registering for the Southwestern Steel Guitar Association Annual Show to get the $105 rate. Remember to make your room reservations BEFORE December 15th, 2012. Chuck Back, Denny Beaver, Rich Brennion, Jonathan Candler, Frank Carter, Bob Case, Doug Childress, Carco Clave, Jim Cohen, Bill Cunningham, Warren Davis, Neil Degraw, Sharon Denny, Tommy Dodd, Rodger Edgington, Skip Edwards, Jerry Fessenden, Peter Freiberger, Mark Giles, Patrick Hickey, Ray Jenkins, Carl Johnson, Fred Justice, Bobby Lee, Larry Lenhart, Chuck Lettes, Doug Livingston, Jim Loessburg, Margie Mays, John McClung, Tom Mossburg, Bob Mueller, Jerry Newberry, Johnny Oakley, Steve Palousek, Rick Schmidt, Mike Sigler, Mike Smith, Herb Steiner, Austin Stewart, Albert Talley, Larry Toliver, Dan Tyack, Jan Wise, David Wright. Our outstanding house band includes Chuck Back, Paul Polish, Dan Range, Roy Rosetta, Denny Sarver, and others. Our non-pedal session has a great line-up this year. We look forward to expanding this portion of our show. 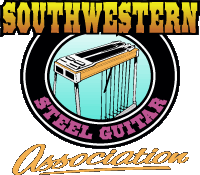 This year the line-up includes three Steel Guitar Hall of Fame Members plus players from all over the United States. This year we are having this portion of the show on Saturday afternoon, with a jam session to follow. It will be held in the Crestview Ballroom, which is across the driveway from the convention entrance. Again this year, Meriul and Peggy have made a gorgeous one of a kind steel guitar quilt that some lucky person will be taking home. Gretsch has donated two very nice resonator guitars with nice cases for our raffle and Silent auction. Tickets for all the raffle items are $5 ea, or 5 for $20. You do not have to be present to win, so if you can't be at the show, please go here for details on how to purchase raffle tickets by mail.